Pure forsterite is composed of magnesium, oxygen and silicon. The chemical formula is Mg2SiO4. Forsterite, fayalite (Fe2SiO4) and tephroite (Mn2SiO4) are the end-members of the olivine solid solution series; other elements such as Ni and Ca substitute for Fe and Mg in olivine, but only in minor proportions in natural occurrences. Other minerals such as monticellite (CaMgSiO4), an uncommon calcium-rich mineral, share the olivine structure, but solid solution between olivine and these other minerals is limited. Monticellite is found in contact metamorphosed dolomites. Forsterite-rich olivine is the most abundant mineral in the mantle above a depth of about 400 km (250 mi); pyroxenes are also important minerals in this upper part of the mantle. Although pure forsterite does not occur in igneous rocks, dunite often contains olivine with forsterite contents at least as Mg-rich as Fo92 (92% forsterite – 8% fayalite); common peridotite contains olivine typically at least as Mg-rich as Fo88. Due to its high melting point, olivine crystals are the first minerals to precipitate from a magmatic melt in a cumulate process, often with orthopyroxenes. Forsterite-rich olivine is a common crystallization product of mantle-derived magma. Olivine in mafic and ultramafic rocks typically is rich in the forsterite end-member. Forsterite also occurs in dolomitic marble which results from the metamorphism of high magnesium limestones and dolostones. Nearly pure forsterite occurs in some metamorphosed serpentinites. Fayalite-rich olivine is much less common. Nearly pure fayalite is a minor constituent in some granite-like rocks, and it is a major constituent of some metamorphic banded iron formations. Forsterite is mainly composed of the anion SiO44− and the cation Mg2+ in a molar ratio 1:2. Silicon is the central atom in the SiO44− anion. Each oxygen atom is bonded to the silicon by a single covalent bond. The four oxygen atoms have a partial negative charge because of the covalent bond with silicon. Therefore, oxygen atoms need to stay far from each other in order to reduce the repulsive force between them. The best geometry to reduce the repulsion is a tetrahedral shape. The cations occupy two different octahedral sites which are M1 and M2 and form ionic bonds with the silicate anions. M1 and M2 are slightly different. M2 site is larger and more regular than M1 as shown in Fig. 1. The packing in forsterite structure is dense. The space group of this structure is Pbnm and the point group is 2/m 2/m 2/m which is an orthorhombic crystal structure. Fig. 1: The atomic scale structure of forsterite looking along the a axis. 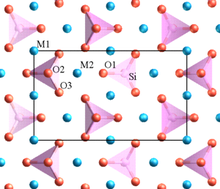 Oxygen is shown in red, silicon in pink, and Mg in blue. A projection of the unit cell is shown by the black rectangle. This structure of forsterite can form a complete solid solution by replacing the magnesium with iron. Iron can form two different cations which are Fe2+ and Fe3+. The iron(II) ion has the same charge as magnesium ion and it has a very similar ionic radius to magnesium. Consequently, Fe2+ can replace the magnesium ion in the olivine structure. One of the important factors that can increase the portion of forsterite in the olivine solid solution is the ratio of iron(II) ions to iron(III) ions in the magma. As the iron(II) ions oxidize and become iron(III) ions, iron(III) ions cannot form olivine because of their 3+ charge. The occurrence of forsterite due to the oxidation of iron was observed in the Stromboli volcano in Italy. As the volcano fractured, gases and volatiles escaped from the magma chamber. The crystallization temperature of the magma increased as the gases escaped. Because iron(II) ions were oxidized in the Stromboli magma, little iron(II) was available to form Fe-rich olivine (fayalite). Hence, the crystallizing olivine was Mg-rich, and igneous rocks rich in forsterite were formed. At high pressure, forsterite undergoes a phase transition into wadsleyite; under the conditions prevailing in the Earth's upper mantle, this transformation would occur at pressures of ca. 14–15 GPa. 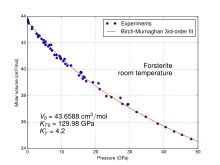 In high-pressure experiments, the transformation may be delayed so that forsterite can remain metastable at pressures up to almost 50 GPa (see fig.). 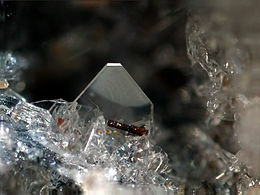 Forsterite was first described in 1824 for an occurrence at Mount Somma, Vesuvius, Italy. It was named by Armand Lévy in 1824 after the English naturalist and mineral collector Adolarius Jacob Forster. ^ a b c Klein, Cornelis; Hurlbut, Cornelius, Jr. (1985). Manual of Mineralogy (20th ed.). Wiley. pp. 373–375. ISBN 978-0-471-80580-9. ^ Lauretta, Ds. ; Keller, L.P.; Messenger, S. (2005). "Supernova olivine from cometary dust". Science. 309 (5735): 737–741. Bibcode:2005Sci...309..737M. doi:10.1126/science.1109602. PMID 15994379. ^ Kushiro, I. "The system forsterite – diopside – silica with and without water at high pressure" (PDF). American Journal of Science. 267: 269–294. ^ Deer W.A., Howie R.A., and Zussman J. (1992). An introduction to the rock-forming minerals (2nd ed.). Harlow: Longman ISBN 0-582-30094-0. ^ Tormmsdof, V. (1966). "Progressive metamorphose kieseliger karbonatgesteine in den Zentralalpen zwischen Bernina und Simplon". Schweizerische Mineralogische und Petrographische Mitteilungen = Bulletin Suisse de Mineralogie et Petrographie. 46: 431–460. ^ Iishi, K. (1978). "Lattice dynamics of forsterite" (PDF). American Mineralogist. 63 (11–12): 1198–1208. ^ Wood, B. J.; Kleppa, O. J. (1981). "Thermochemistry of forsterite – fayalite olivine solutions". Geochimica et Cosmochimica Acta. 45 (4): 529–534. Bibcode:1981GeCoA..45..529W. doi:10.1016/0016-7037(81)90185-X. ^ Wilson, M.; Condliffe, E.; Cortes, J.A; Francalanci, L. (2006). "The occurrence of forsterite and highly oxidizing conditions in basaltic lavas from Stromboli volcano, Italy". Journal of Petrology. 47 (7): 1345–1373. Bibcode:2006JPet...47.1345C. doi:10.1093/petrology/egl012. ^ Deer, William A. (Dec 1, 1982). Rock-Forming Minerals: Orthosilicates, Volume 1A. Geological Society of London. p. 264. ^ Frondel, C. (1972). "Jacob Forster (1739–1806) and his connections with forsterite and palladium" (PDF). Mineralogy Magazine. 38 (297): 545–550. Bibcode:1972MinM...38..545F. CiteSeerX 10.1.1.605.3767. doi:10.1180/minmag.1972.038.297.02. ^ http://minrec.org/labels.asp?colid=726 Mineralogical Record, Biographical Archive. ^ Ramesh, S.; Yaghoubi, A.; Lee, K.Y.S. ; Chin, K.M.C. ; Purbolaksono, J.; Hamdi, M.; Hassan, M.A. (2013). "Nanocrystalline forsterite for biomedical applications: Synthesis, microstructure and mechanical properties". Journal of the Mechanical Behavior of Biomedical Materials. 25: 63–69. doi:10.1016/j.jmbbm.2013.05.008. PMID 23726923. 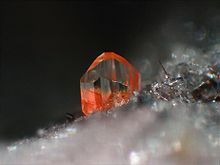 Wikimedia Commons has media related to Forsterite.